Hi….I wanted to make sure to tell you upfront that I have received no product or compensation to promote this grill. 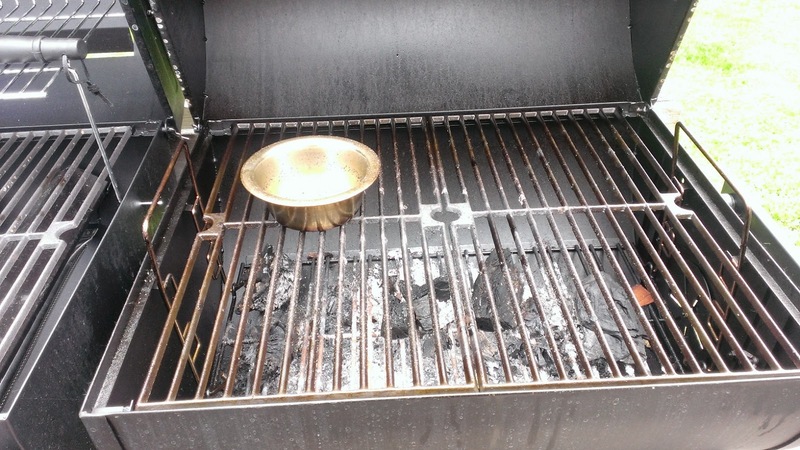 I wrote this post because I love the grill! Thanks for visiting. Summertime I love to cook outside. So does my hubby. For the past few years every Spring we check out the gas and charcoal grills. I love the convenience of gas - my hubby loves charcoal and also to smoke food. We have always had a gas grill and a separate smoker. The smoker we keep at the RV because we do a lot of entertaining there - both locations have gas grills. The grill at the RV is on it's last leg. It is a Coleman large outdoor grill that is 10 years old. The kids bought it for us for Christmas 10 years ago. A great grill but she is getting past her prime. So this year we knew we needed to buy a new grill for the RV. While shopping for a new grill...we decided to buy a new grill for home. We are going to take the old home grill to the RV and give Dawn the old RV grill. Dawn's hubby loves to fix stuff - so the RV grill will be a good project for him. Check out our grill .... one side gas for me and one side charcoal and smoker for him. Perfect for us - It is a Brinkmann Dual Function grill - we bought it from Home Depot. Hubby and Jason decided to they would put it together. They both agree it was not a nightmare to put it together. They had no extra parts and they were still speaking to each other when they were finished. Both good signs to a happy put-together! One side of the grill is gas and the other side is charcoal. 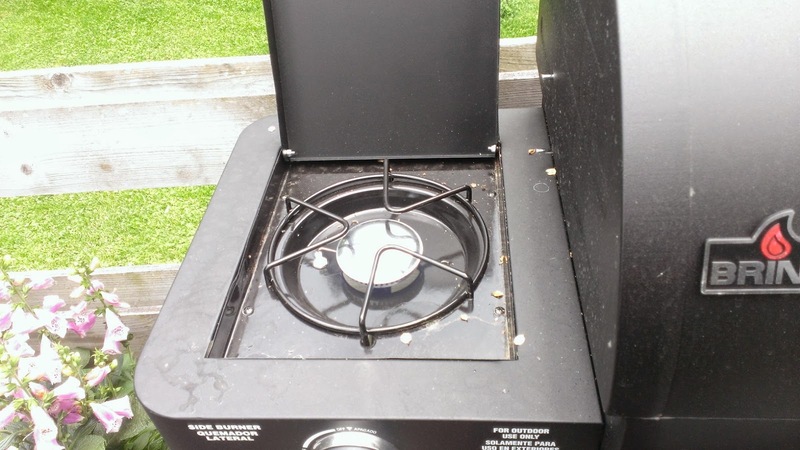 There is also a outside burner - which I love for making corn on the cob. The gas section has a good size grid with a warmer shelf. The charcoal side also has a smokers box. Easy to use for me and just what hubby wants to make smoked meats and charcoal cooking. After years of marriage we have learned to not only give in once in a while but also how to be creative in our purchases. Buying something that meets both our expectations is our goal in all purchases. The Brinkmann grill did just that! Next week we are taking the old grill to the RV. Until then the deck is perfect for some serious cooking. We totally need a grill and I want a smoker. This is the perfect answer for my family. I am sharing this with my husband. It's huge and smokin'! My brother in law is a serious grill afficionado. I think he makes the best smoked ribs in town! I bet he will want this Brinkmann for his birthday. Must tell the sister. Thanks for the idea! I want a grill like that!! Ours is so small, but that one would be perfect for when we have parties!! That would be perfect when we replace ours...right now we have a separate grill and smoker. Wow that looks amazing,We love cooking outside but have no grill right now. We JUST bought a grill last weekend. The sale was good and it was free delivery, too. I'm a propane girl all the way. Charcoal tastes funny. I SO must have one of these. Showing this to my hubby. I love that it has two different grills! Our home could definitely use this! That's an amazing looking grill. We really like smoking, too so it would be a nice addition. We need to pick one of these up, our smoker just quit recently and I've missed it!! I have a question.. WE just got an RV and maybe yours is much bigger.. How do you fit your grill in the RV or do you stick it in the bed of the truck and isn't it heavy? We have a cheap grill for our RV.. like cheap.. We def want to invest in a smoker. We keep our RV parked at a campsite all season. Plymouth Rock in Elkhart Lake, WI. We have a huge deck and yard space. It looks like you've got some yummy food coming your way this summer! I love when my husband cooks up burgers and steaks on the grill, but we could use a new one, too. Super fancy grill! We need something that's meant for larger parties, but my husband has placed other house projects in front of a grill. That looks like an awesome grill. I love grilled food. What an awesome grill! We love cooking out during the summer. What a perfect solution! 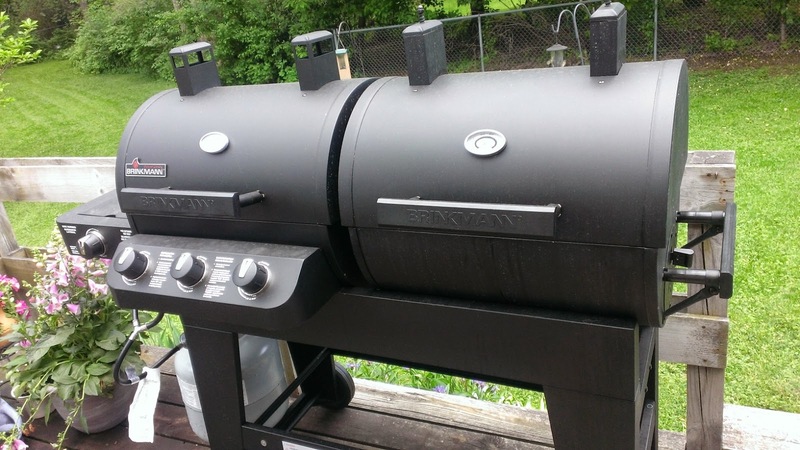 We prefer gas grilling, but it's nice to have a smoker option too. My husband has been wanting a dual grill! That one looks awesome! What a great grill! I bet the food comes out delish too! Wow! I know my husband would love this. What a great idea for Father's Day. That is a beautiful grill. We need a new one. Ours is so old. My Dad would love that! He's been talking about a smoker for forever! That's nice! I'm marveling at the thoughts of how many yummy things you'll be able to make! Well Wow!! You get the best of both grill worlds. We just had to replace some parts and pieces in our grill. My husband has been wanting something similar for a long time. Maybe for Father's Day? I need this in my life! My husband would love it! Wow, that is quite a grill! I really need to learn how to grill. Okay, sooooo totally jealous!! I'm really wanting to find a grill for my husband for Father's Day. 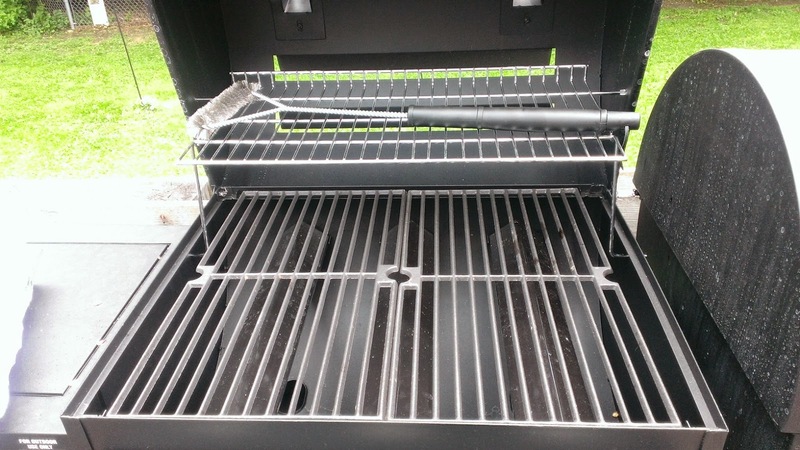 The Brinkmann Dual Function Grill sounds like the perfect grill for my hubby. He has a separate gas grill and a smoker so this would consolidate into one plus add the charcoal element. He'd love it! That grill certainly will stop arguments in your house! It probably would stop arguments in most homes! I live in an apartment so I can't use one but I can say beyond a shadow of a doubt that this is the type I would pick if I did. The Brinkmann Duel Function Grill is a serious grill! And an argument stopper. Can't go wrong with that! I must say I am totally jealous right now! lol I want one of these grills SOOOOO bad! Thank you for sharing! That looks like an awesome grill! My husband and father in law would love one! I am in love with the new grill! So cool. I love cooking outside also! That's one serious grill. I love it. I wish i was good at grilling. My cheap grill just fell over last time I used it. It's all corroded. Time for me to step up to the big leagues with something like this. 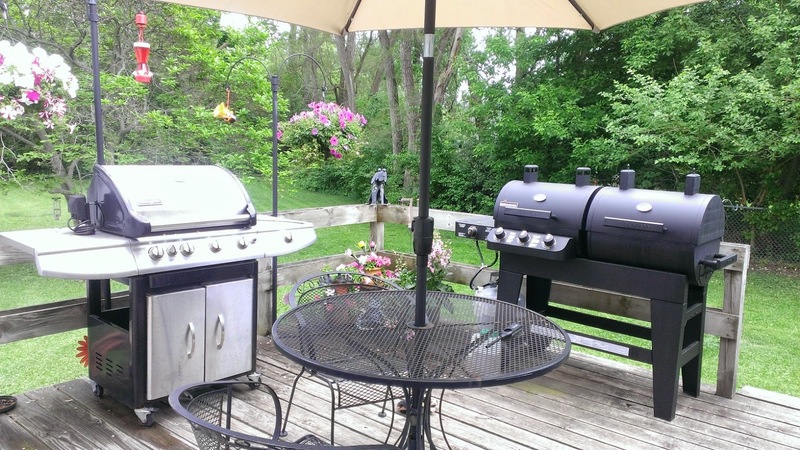 We LOVE to grill, and I totally am jealous you have a smoker.. That is next on my to get list! My dad is the grill MASTER, he buys a new one every other year and even grills in the middle of winter! Im sure he would love this. Ugh I need a grill like that to replace the two smokers and charcoal grills. Then it'd be all contained in one. Wow! That is one amazing grill. We love to cook outside as well. What's summer without a lot of outside cooking and dining? My husband can never know about this grill! I won't even tell you about our pitiful grill out back. LOL! I am trying to convince the hubby we need a new grill. Ours is almost 10 years old! But he has this silly thing we need a water softner first. We just have one of those small square grills on our back porch. The hubs is wanting one of the bigger ones maybe for father's day. Now thats a fancy grill! I would love to have one of these grills. Thanks for sharing. This is one sweet grill, my hubby was drooling over my shoulder looking at the pictures! Amazing! Woah! I need to get off the page before the hubby gets any ideas! We just got a new grill- but he would upgrade if he saw this one! This grill looks NICE. The grill we have is a simple propane thing. I would like to try somehting like this because I think I could really go to town and have fun. This looks really nice! We need a new grill this year because the bottom part of ours fell out (it's weird to explain). Assuming this is the case, at that point you are probably going to have an outdoor flame broil.